I walked into the BCA (Burlington City Arts) firehouse gallery shaking from the frigid Burlington air. I had ventured out into the cold to see Adam Putnam’s “magic lanterns” exhibit. Maybe my brain was still frozen, but for some reason I wasn’t too excited about the exhibit and haphazardly walked upstairs to the second exhibit. On the second floor photographer Evie Lovett’s exhibit, “Backstage at the rainbow Cattle Co.” caught me by surprise. Locking around I saw large black and white photographs of women preparing for some kind of show, it wasn’t until I really started to look around that I noticed these weren’t women, but men, these were photographs of a drag show! At this point I decided to read the blurb about the show before I missed out on any more important details. 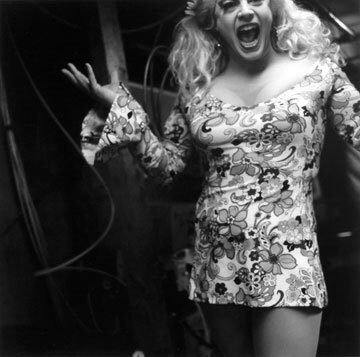 Lovett’s photographs show the backstage preparations before a drag show in rural Vermont. The amazing part of this exhibit is that there is an easy to use and helpful audio guide that is accessed through your cell phone. Lovett creates a dynamic show by using recordings of different men underneath their photographs. Perhaps it was because I had the gallery to myself, but in this exhibit I easily fell into their world. The men in the pictures became characters who I wanted to know everything about. The photos are personal yet mundane. This contrast plays with the idea that drag shows are not such an ordinary occurrence, especially in rural Vermont. Who are these men, where do they work? What is life like for them? How did Lovett build a close enough relationship with these men that they allowed her into their world? Where and when is the next drag show because I want to check it out! I’m hoping that my questions will be answered at a lecture given by Lovett on Wednesday February 8th at 7PM or at the “Drag Show with the Ladies of the Rainbow Lounge/artist reception” Friday February 17th 8PM. Lovett’s work will be on view on the second floor of the firehouse gallery until March 24th so you have no excuse not to stop by and check it out! Burlington City Arts is a center whose aim is to enhance the arts in Burlington through shows and classes. It’s open Tuesday through Friday 9-5 and Saturday 12-5.